Education debates don’t lack for voices wanting to join in the fray. In fact, sometimes the din can be overwhelming and the sentiment less than genuine. Today The 74 is launching “Keeping It 100” to have the opposite effect. At The74Million.org/KeepingIt100 (and on social media at #KI100), we’re offering students, families, educators, and leaders a new platform through which they can cut through the noise and get to the heart of what’s happening inside our schools and to the students who spend their days there. “Keeping It 100” is another way of saying keeping it real or truthful or 100 percent undiluted. When it comes to education, that means blunt conversation about the forces blocking too many students from accessing the teaching and learning that taps into their greatest potential. With so many of these issues disproportionately impacting communities of color, Keeping It 100 will prioritize a diverse spectrum of contributors, elevating African-American and Latino perspectives that are too often underrepresented in these conversations. A mere sampling from today’s launch lineup includes Sharif El-Mekki, a charter school leader in Philadelphia, who talks about the isolation and obstacles confronting the 2 percent of American teachers who are black males and how the national convening of The Fellowship — Black Male Educators for Social Justice provides a powerful antidote. Tim King, CEO and founder of Chicago’s Urban Prep, takes on the debate over whether all students should be encouraged to attend college. Urban Prep’s students are all black males, most of them low-income, and 100 percent of them are admitted to college. Brendan Lowe, a journalist, profiles the new nonprofit Branch Alliance for Educator Diversity, which is devoted to strengthening the minority teacher pipeline. Nearly half of minority teachers in American public schools come from just 13 percent of colleges and universities, but professors at these colleges — schools with high percentages of students of color that the federal government designates as minority-serving institutions — say their graduates are regularly underestimated, despite the widespread need for teachers of color and research that shows these schools are as good as or better than predominantly white institutions at preparing teachers. Shawnta Barnes, an educator, writer, mother, and Indianapolis native, sheds light on how a government consolidation in the 1970s intentionally did not include schools, leaving Indianapolis with 11 different districts where the issues facing black students often go undiscussed. Speaking of Indianapolis, the city marks the beginning of a 10-city national tour The 74 is undertaking with African-American journalist Roland Martin in conjunction with Keeping It 100. We will be in Indianapolis this Sunday; more than 300 people are expected to come for a live discussion about some of the same issues that will be featured on KI100. If you are interested in attending, you can RSVP here. 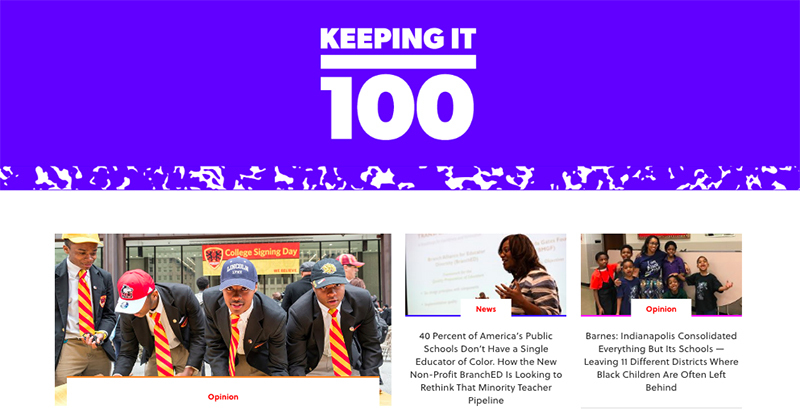 Keeping It 100 joins the growing list of websites in The 74 network developed to share news and perspectives for specific audiences, from parents (4Fams) to policymakers (School Improvement), politicos (EDlection), researchers (Big Picture) and good-news enthusiasts (Inspiring). This is all in addition to our three microsites published in tandem with new books: The Founders — Inside the Revolution to Invent (and Reinvent) America’s Best Charter Schools (read here); The Alumni — Inside a Groundbreaking Campaign to Get High School Grads Through College (read here); and Reinventing America’s Schools: Creating a 21st Century Education System (read here). We hope this newest space will become a daily destination for shedding light on and sharing stories about equity, the achievement gap, and how education can be a force for empowering communities of color rather than holding them back. You can bookmark The74Million.org/KeepingIt100 right here.